The G20 Summit that took place last week in St. Petersburg showed that the leaders of the world economies are more eager to reach agreement on global economic issues than to overcome political deadlock over potential military reprisals against Syrian government. As the international community kept a close watch on the leaders of Russia and the U.S., President Vladimir Putin in a closing press conference made one thing clear: No compromise has been reached. Speaking about a brief 20-minute talk with U.S. President Barack Obama on the sidelines of the summit, Putin said that each of them stuck to their own opinion. “But there is a dialogue between us: We hear each other, understand each other’s arguments,” Putin said. He reiterated his stance that an assumed chemical attack near Damascus in late August was “a provocation” of the rebels, who want to receive international backing to topple Syrian leader Bashar Assad. Russia, a long-time Syrian ally, supports and will continue to support Assad, even if he is attacked by a U.S.-led military coalition, Putin said. “We will help [the Syrian government] like we’re doing now by supplying arms, cooperating in economic sphere,” the Russian president told journalists. Obama, who stands for a military invasion of Syria that would bypass U.N. Security Council authorization, said the Syrian regime was a threat to the world and to its neighbors. “Failing to respond to this breach of the international norm would send a signal to rogue nations, authoritarian regimes and terrorist organizations that they can use weapons of mass destruction and not pay a consequence,” he said. The U.S. president described his conversation with Putin in a more hopeful rhetoric, saying that they had agreed that the crisis must be resolved through political transition as it is laid out in the Geneva plan. However, several hours after Obama’s speech, the White House released a statement that declared support for strong punitive measures against Syria. The document was signed by 11 states: Australia, Britain, Canada, France, Italy, Japan, Saudi Arabia, South Korea, Spain, Turkey and the United States. Germany announced later on Saturday, Sept. 7, that its leader, Angela Merkel, had also signed the document. Since the Obama-led group of anti-Assad state leaders outweighs the Putin-led opposition among the G20, it is a sign that an air-strike is highly possible. Yet Washington has to overcome the final obstacle — its own Congress — which is supposed to carry a vote on the military measures. Obama failed to say what his actions toward Syria would be if Congress voted against a military campaign. Amid diplomatic tensions, G20 members showed a much higher degree of cooperation on economic and business issues. 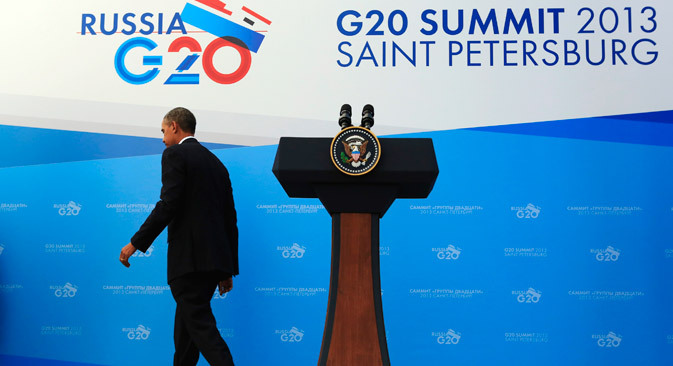 This summit shifted from anti-crisis measures and emergency steps, which have dominated the G20’s agenda since 2009. Job creation, tackling corruption and tax avoidance, as well as recovery and growth, were in the spotlight in St. Petersburg. According to Russian Finance Minister Anton Siluanov, the global current economic situation is better than it was a year ago, and thus the G20 leaders’ task was to ensure sustainable growth of the world’s economies. Among the measures to boost economy was an international framework for tackling tax debasement (when companies avoid paying taxes in countries where they operate). It was agreed to develop a way to implement this plan over the next two years. The leaders also discussed financial regulation and supported the idea of regulating the activities of big banks that are known as “too big to fail.” Currently, there are 28 such banks and 9 insurance companies. The G20 leaders debated structural measures that are both unique to each country (such as infrastructure, new legislation and job creation) and the global economy (aimed at preventing protectionism and promoting free trade). With its presidency in the G20 in 2013, Russia has put forward a tradition of labor and finance ministers’ meeting aimed at reconciling business and trade unions’ demands. Russia is also the first G20 host country to establish a mechanism for monitoring the implementation of recommendations adopted in the final declaration, Alexander Shokhin, the head of the Russian Union of Industrialists and Entrepreneurs, said. “There are piles of documents signed at the summit. The majority of them have so-called soft commitments [that are] not obligatory for implementation. The more there are strict commitments in the final declaration, the better,” Shokhin said.